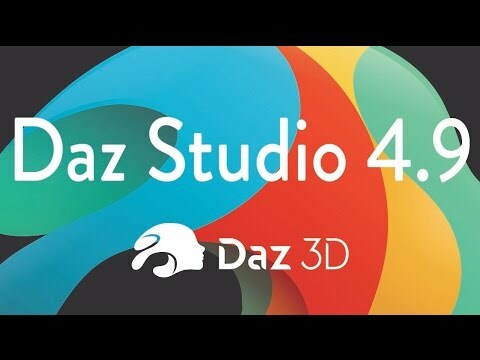 Daz 3D is pleased to announce Daz Studio Pro BETA - version 4.9.0.54! Right-click an asset and choose "Explore Product..."
Right-click an asset you've created, or was installed without metadata, and choose "Explore User Assets..."
Right-click an asset and choose "Explore Add-Ons..."
Right-click an asset and choose "Explore Targets..."
Right-click an asset and choose "Categorize..."
Create your own category hierarchy next to the "Default"
Pane options menu > "Export Product Metadata..."
Right-click an asset and choose "Group As > %"
Right-click an asset and choose "Browse to file location..."
Right-click a product and choose "Install"
Right-click a product and choose "Install Update"
Right-click a product and choose "Uninstall"
Right-click a product and choose "More Information..."
Right-click a product and choose "Explore..."
Right-click a product and choose "Update Metadata..."
Right-click a product and choose "Export Metadata..."
Right-click a product and choose "Group As > %" or "Group Contents As > %"
Right-click a product and choose "Browse to folder location..."
Right-click a folder and choose "Browse to folder location..."
Specific Bridge error codes have been added to IRender context::render() and remapped some error codes for the cloud render contexts to match. Especially important are connection errors and errors when trying to render with IrayServer when streaming is disabled which before both returned -10 and now return -12 for connection error and -13 for streaming disabled. The handling of the option mdl meters per scene unit for materials with material parameters and baked environments has been fixed. The initial meters per scene unit settings were not correctly broadcasted. Before the first scene update, a value of 1.0 was always reported. Now the correct settings are reported even before the first scene update happened. When interactively adding new instances of a geometric object, the internal scene handling was breaking the instancing and hence led to unnecessary memory consumption. This has been fixed. Caustic brightness differences with environment maps, introduced with the last release, have been fixed. A crash when hiding finite area lights has been fixed. A possible crash when rendering to completion, changing the render targets (size, type, etc) and render, has been fixed. A bug causing a crash when attempting to render while no canvas is available has been fixed. A possible crash after changing the intensity of a point light or rectangular finite light has been fixed. A bug has been fixed that could lead to a fatal tag access when rendering with Bridge and if elements were deleted from the database in a certain way. A rare hang bug has been fixed that could occur when calling cancel render on a cloud render context. An issue when calling cancel often when rendering with a cloud render context using "synchronous" video mode has been fixed. A crash happening when an MDL file containing an incomplete array declaration was rendered over the bridge has been fixed. I've just installed this beta version. I hadn't installed any previous 4.9 beta. I connected to my account. I'm totally lost, though, on how to get over the initial setup hump with this 4.9 Daz Studio. I'm sure this has been discussed and worked out, but search is not finding relevant discussions for me. 1) Am I supposed to map my existing DS 4.8 Content Library in the DS 4.9 Content Directory Manager? Is that how I will be able to see my migrated content? I read about 4.9 using the same database, but I'm not clear on whether that means the same Content Library directory on disk or whether that is just metadata stuff. If I map the one I used in 4.8, will I still be able to use it in 4.8, too? 2) I don't want Daz content on my C drive (SSD). Can I create a different directory for Daz Connect Data and map it in the Content Directory Manager instead of the default one on C? Thanks. I'm eager to try it, once I can find my migrated stuff. 1) Yes, if you want to be able to use it you will need to map your directories; the beta doesn't inherit any of your settings from the release version. 2) AFAICT, the connect downloads will go into a 'cloud' directory under the data directory in your first mapped Studio format folder; it can be anywhere you want it to be. Thanks for your help. I've now mapped my Daz Studio and Poser directories to the folders I was using in 4.8 and I see my content. But I'm still puzzled by that first entry in the Content Directory Manager for "Daz Connect Data". Are you saying that Daz Connect content won't go in there, but will go in a cloud subdirectory beneath my topmost Daz Studio Formats directory? What is it there for then, I wonder? OK - I haven't looked at this beta yet (fighting connectivity issues) so it looks like they've moved to connect data to its own directory; I think DAZ_Rawb may have mentioned looking at that. So if that's the case, point it where you want it. If you're just doing the metadata downloads it should only be a hundred MB or so; the real concern is if you actually download products. Yup. I tried it. I downloaded a product and it went into subfolders in the C drive directory. I'll have to try changing that tomorrow. Yes, you do need to map any content directories that you want to use with the beta, in the beta. The builds provided through each channel have and use their own unique application settings. This is done to test/ensure that the settings themselves, as well as the mechanisms involved in retrieving, setting and/or removing them, are functioning as intended. Mapping a directory in 4.9 does not cause that directory to be inaccessible to an earlier build. Know, however, that any files you save to a directory that is shared between 4.9 and an earlier build may show up in the Content Library pane of the earlier build but will not show up in the Smart Content pane—because the Smart Content pane is database driven and the metadata saved to the database in 4.9 is not read/understood by earlier versions. The way to get around this fact is to use the new metadata export functionality in 4.9 (see above—look for "Export Product Metadata...") and then reimport that in the earlier build. Provided the same directories are mapped, the relative paths specified within the metadata files should be resolved and the metadata should be imported. Yes. 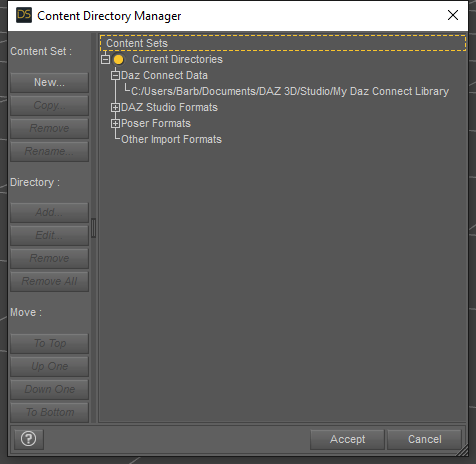 I added the ability to separately set the Daz Connect Data directory to Content Directory Manager in 4.9.0.35. (see the change log for Public Beta 4). The new setting is implemented such that, like the other directory mappings, it is recorded as part of a "Content Set." Meaning, you can have different mappings configured as a "set" that you can switch between from within the Content Directory Manager dialog. Unlike the other mappings, however, within any given "Content Set" there is only one mapped Daz Connect Data directory—notice that you can "Edit," but "Add" and "Remove" options are disabled when selecting the Daz Connect Data items. Having said that, it is important to understand that the usual path resolution system in Daz Studio is at play here as well—i.e. if a relative path cannot be resolved using the primary setting, the application will successively/sequentially step through the remaining mappings [of the appropriate type] until/unless the path is resolved or the end of the list is reached, whichever occurs first. Changing the Daz Connect Data mapping does not move the data itself, it only changes where new data will be downloaded/installed to. As the change log states, Content Directory Manager will prompt you to add the previously mapped directory to the list of native format directories if that directory is not already in the list—to help keep saved references working correctly. Close. Same first name, different screen name and department—DAZ_Rawb is "Web Rob"; he is one of the developers that works on the "DzCloud" library [mentioned in the change log] which is used by Daz Studio to communicate with Daz web services and the database in 4.9, but he does not work on Daz Studio proper; his primary responsibility is the website and the web backend. Perhaps you are remembering where DAZ_Rawb said there may be some UI updates to let you set this explicitly in a future build ? Obviously his statement turned out to be accurate, but he wasn't referring to work that he himself was doing or had done. Rob (rbtwhiz) I REALLY appreciate the time you took to address my specific questions and highlight the appropriate documentation sections! Wading through all this and understanding it all in context has been kind of confusing, but you helped a lot. I'm sure it will be helpful to other people just trying to get through the initial setup, too. I'm up and running now with 4.9 Beta and have my old content directories mapped and my Connect data moved to another drive. Thanks for explaining the significance of the export metadata function. I saw that in the menus, but I didn't know what it was for. The new checkbox to turn off Smart Content filtering by context is nice for people who like to autofit clothing. I'd love to see an expansion of this that lets me filter by generation and gender, so for example. I could see all G2F compatible items. This would help me know what older generation an item was compatible with, so I could fill out the autofit dialog section for "supported" correctly. The more generations we get, the harder it is to remember what model a specific clothing item went with when autofitting. As an alternative you could create a new category (And potentially sub-categories) for the generations, then copy the clothing into the new categories for just that purpose. Whoops, I ran in to a problem. The Smart Content Products tab "Available" section is showing at least 3 products that were already installed in 4.8 and should have been migrated to 4.9, because I mapped the same Content Library. They were installed by the DIM in 4.8, and the DIM confirms that they were installed to the Content Library I have mapped. All three are morph/clone type products. In fact, as I scroll though the available list, I see lots more morph type products that should already be installed. Do I need to write a bug report, or is this a known issue? Edit: I see I wasn't logged in when I tried that, so I logged in, but had the same result. Oh, that's a great tip! I've already created subcategories for figures by generation, so this is a natural extension to that. Is there an easy way to "copy clothing into the new categories"? 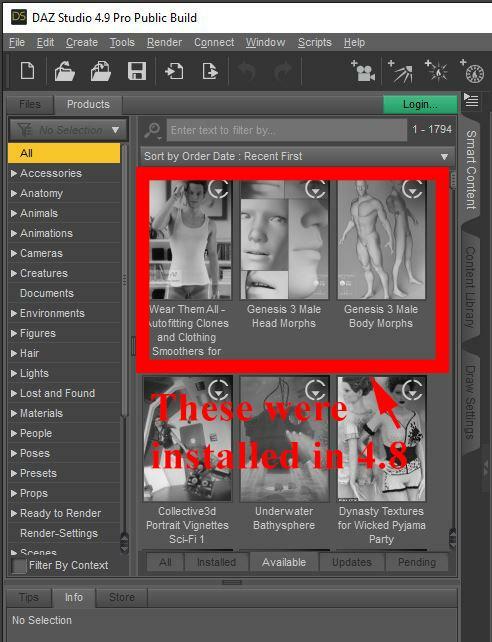 Say for example that I loaded a Genesis figure and went to Smart Content/Wardrobe and Filter by Context turned on. That should show me all the compatible clothing. Now, how would I assign all those to a new category all at once? The method I use, once I get the categories I want, is to check the box to filter by context. Put the generation figure you want to get the content for, in the scene, for example Genesis, Select that figure, go to the category or subcategory, in Smart Content you want to copy from, which should now be content that works with Genesis, select the stuff you want in your new category (Ctrl/CMD select, Shift Select and Ctrl/CMD+A all work) then drag and drop them from the old category to the new category in the list on the left. Check the box Filter by context. Go to the category you want to copy from. Select everything you want in your new category. Drag and drop that content into the name of the new category on the left. Thanks for the step by step. I created 2 new categories to try this out. I went to Wardrobe/Footwear and created G3/Male and G3/Female under that. Then I loaded G3M and G3F, selected each one individually and dragged their compatible footwear into their corresponding new categories. That level of categorization would require creating a lot of new subcategories, so I have some questions before I invest all that time. If I do all this work, will it be preserved when the Beta is over and I install the released 4.9, or will I have to do it all over again? If I get an update to one of these products I've copied to the new categories, will the updated items still be assigned to my new categories, or will that get wiped out by the update? Would it be better to categorize and assign the files in 4.8 so both 4.8 and 4.9 will be able to see and use the categories (if I read the Important Notes correctly)? Thanks for helping make this great product even better by customization!!! Remember to export your Userdata so that if you have to reset your database you still have it. 1. Generally the Release version and the Beta share the database. During this Beta that is an exception, 4.8 and 4.9 do not share the database. Once 4.9 becomes the release, the Beta and release will share the database again, unless/until the tables have to change again in some future beta version. So if you do the customization in the Beta it will carry over to 4.9 release. Customizing in the Beta will not carry over to 4.8. 3. If you Create custom Metadata in 4.8 it will work in 4.8, and will migrate to 4.9, either beta or release. Note if you also use Smart Content in Carrara, you will want to create custom metadata in 4.8 since those are the tables that Carrara, currently, uses. You generally don't have to customize metadata to show generation for supporting products, as having the figure in the scene will filter for you the content that works for the figure. While you can do it for everything, you can also just do it for things you intend to use for Autofit. Also if you intend to use the same item autofitted on a regular basis, you can, once it is autofitted once, save it as a wearable preset and categorize that for the figure it is now autofit to. This is something I do on a regular basis. So for example I have a set of clothing I want to use through a story. I autofit it once. I add a push modifier, and/or add collision and smoothing and add any morphs i want in the clothing, for example Zev0's Fit Control. I then save it as a wearable preset. I then, with the new base figure (For example Genesis 3 Female) selected in the scene drag it from the Content Library location where I saved it, and drop it in the proper place in Smart Content. Instead of autofitting the clothing from now on, I grab the one I just saved, right out of Smart Content and it fits, plus has all the settings I added to make it work better than a straight autofit. Thanks. Yes I know about selecting the figure and finding compatible content in Smart Content. That has always worked well, as long as the metadata is accurate. I love Smart Content! It is selecting items from other generations to autofit that has been cumbersome, because it is not usually easy to know what generation they were for, so filling out the autofit dialog is tricky. I have also saved autofitted clothing with added morphs (Fit Control is what I use, too), but I haven't done that much. Maybe I should do more of that for clothing that autofits well. Your ongoing support in the forum is very much appreciated! Do you have any advice on the problem I posted up above, about installed products showing up in the Available section? I'll have to take a closer look at those products. Can you please file a bug for me. https://helpdaz.zendesk.com/tickets/new Mostly so this doesn't get lost. Any plans to include CS#204529? (texture tiling/vertical offset and per pixel shading issue with viewport versus render) CS said it would be fixed in next release, but that was back at build 41 timeframe. ...but I see we are at RC already? I tried build 44 and it wasn't fixed at that point. Release Candidates install over the betas, so you can still run it side by side with the previous stable release. PC+ prices are not showing in the Store tab, even though I am logged in. I searched, but could not find a reference to this problem. It is so obvious, it must have been discussed, but forum search is not helpful. Edit: It just changed. After I clicked on one to buy it, it showed the correct price in the cart. When I went back to the store tab, without completing my purchase, the store tab now has the correct PC+ prices.